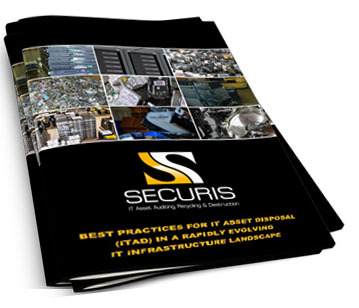 As an electronic recycler, refurbisher, re-integrator, and data destruction firm, it’s Securis’ mission to provide environmentally sound solutions for the secure, effective management and removal of any organization’s end-of-life electronic assets and to provide the most secure data destruction services in the industry. The organization’s commitment to improving the environment is an expression of our Guiding Principles and a demonstration of “think globally and act locally” sensibilities. We strengthen our commitments by utilizing ISO 14001, OHSAS 18001, R2 and other applicable industry standards to make up our framework to help identify and set objectives as well as targets for measuring and addressing areas of significance within our goals. We continually improve our services by maintaining proper customer relations and feedback and building on our existing systems by implementing the principles of Plan, Do, Check, Act methodologies. Above all, our employees will strive to continuously improve our efforts to create a cleaner and safer environment and workplace. To continuously improve waste management practices and reduce consumption of natural resources. To minimize noise and other nuisances and to assist in the management of ecology including pollution prevention and reduction of emissions. Continually improving customer satisfaction reports. Improve our database infrastructure and inventory tracking. Improve communications with the warehouse staff. Improve the current security system(s). Updating designated warehouse controlled areas to ensure optimal space usage as well as safety. Continually receive annual training on environmental, quality and safety topics. Reduce energy consumption on an annual basis. This policy will be communicated and made available, in regards to the performance of our systems to the public, suppliers, customers, contractors and all other interested parties.